The Truckee River is an excellent source for hydroelectric power generation. Truckee Meadows Water Authority (TMWA) has three hydroelectric power plants: Fleish, Verdi and Washoe. All three plants are located on the Truckee River, which runs along Interstate 80 west of Reno. These hydroelectric power plants were constructed in the early 1900s to supply electricity to Virginia City and its mines. Now, more than 100 years old, these run-of-the-river plants still play an important part in TMWA’s operations. Collectively, TMWA’s hydroelectric plants produce an average of 6.7 megawatts of power, enough to power approximately 3,500 households. How does hydroelectric power help TMWA? Power costs are one of TMWA’s largest expenses. We rely on gravity as much as possible to divert, treat and distribute water to our customers; however, in a mountainous community like ours, we still need to pump water and use energy for other purposes, in order to deliver water to your door. These hydroelectric power generation plants are a significant source of clean, renewable energy, generating on average 50 million kWh per year, depending on river flows. Since 2007, TMWA’s pumping and treatment facilities have consumed an average of 50 million kWh per year. How does TMWA generate hydroelectric power? Water for hydropower generation is diverted from the river well upstream of the actual hydropower plant and is transported in flumes or canals along the river at a slope much less than that of the natural river. The water is then piped to a turbine that is connected to an electric generator. The height of the pipe above the turbines and the flow of water in the pipe provide the force necessary to turn the turbines. Simply stated, the greater the fall and the flow of the water, the more electricity can be produced. Hydroelectric energy generation is one of the cleanest forms of energy production. 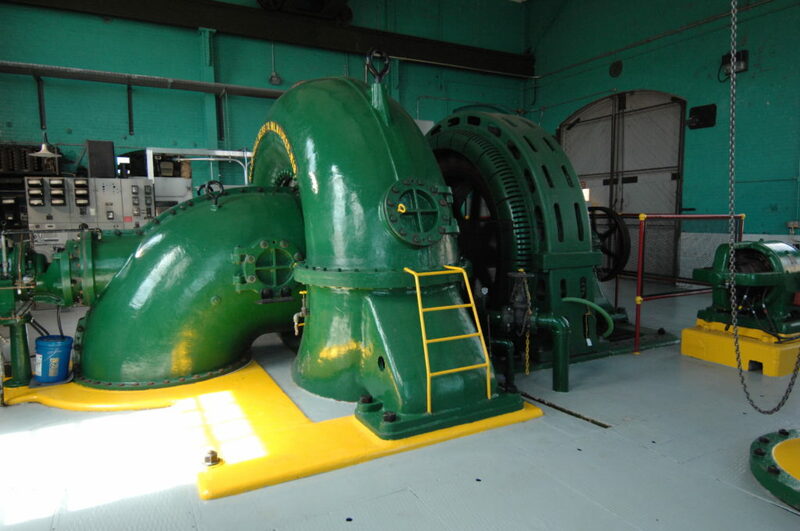 Run-of-the-river hydroelectric plants, like TMWA’s, rely on gravity to move diverted river water through canals to the power generation facilities. After the water passes through the generators, the water is returned right back into the river (non-consumptive use). It does not require many employees to run a hydroelectric station. In fact, all three of our plants are operated and maintained by only seven full-time employees. Hydroelectric power is a renewable form of energy. Like wind and solar, it does not rely upon finite resources such as natural gas or coal to produce power. Hydroelectric stations can operate for many years after they are built compared to the 30 to 40 years a nuclear plant operates. Many of the country’s hydroelectric plants, including TMWA’s, have been in operation for 50 to 100 years or more. Improvements made to maintain TMWA’s hydroelectric plants and optimize their power generation capacity over the past few years had quick payback periods of two to five years. TMWA is proud of its ability to generate more than 90 percent of the power it uses through clean, renewable hydroelectric power. Due to improvements made over the past several years to the Highland Canal raw water delivery system, the installation of a 30 kWh solar power generation project, and multiple improvements in the efficient use of power at our two water treatment plants, TMWA anticipates lowering its power needs going forward and closing the gap between energy usage and renewable energy generation. Since 2011 we have produced nearly as much power as we have consumed. In addition, we will continue to look for cost effective opportunities to expand our use of alternative energies and reduce our use of power.